Made by Containers Limited in Melbourne, Victoria, Australia, 1956. Richard Beck’s design for the 1956 Melbourne Olympic Games poster was one of five designs submitted to the design competition organised by the Melbourne Olympic Committee in 1954. Selected as the winning entry, the design was first released in December 1954 as a postage stamp to draw attention to the forthcoming Games. The stamp was awarded a bronze medal at the International Stamp Congress in Milan in 1956. Poster, in vertical format, cream paper, printed with a dark blue background, fading to a lighter blue in the bottom third of the page. The central image mimics a sheet of white, folded paper, bearing the Olympic symbol of five interlocking coloured rings. Below this is the coat of arms of the city of Melbourne. The text on the poster has been printed in light blue and white. 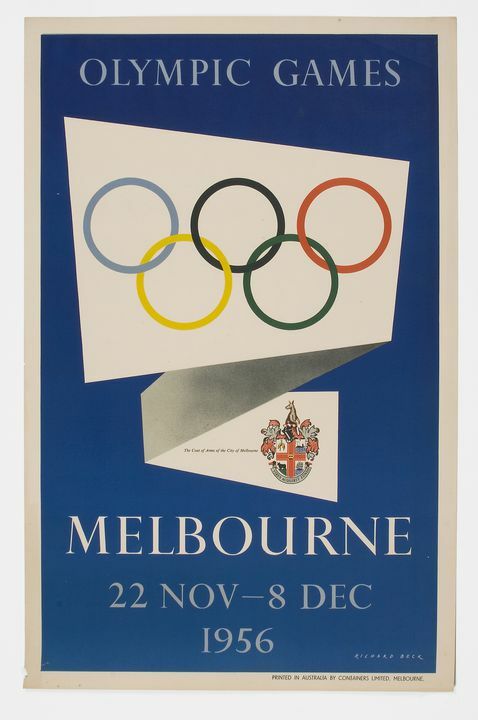 Text on the poster reads from top to bottom, in white 'OLYMPIC GAMES / MELBOURNE / 22 NOV - 8 DEC / 1956'. In the lower right hand corner in white is the signature of the designer 'RICHARD BECK', to the left of the coat of arms reads, in black, 'The Coat of Arms of the City of Melbourne' included in the coat of arms the Latin motto 'VIRES ACQUIRT EUNDO'. Designed by Richard Beck. Printed by Containers Ltd, Melbourne, 1954-1956. Graphic designer and photographer Richard Beck trained and studied in England and Germany before migrating to Australia. Born in Hampshire, England, in 1912 and educated at the Glasgow Academy and Sevenoaks School in Kent, the Slade School of Art in London and the Blocherer School in Munich, Richard Beck arrived in Australia in 1940 after leaving England for New Zealand in 1939. In London, Beck had his own design consultancy service before the war where he earned a distinguished reputation as an artist and designer for his illustrations in a number of English newspapers and for his poster and publicity designs for London Transport, Shell Mex Ltd and the Orient Line. During WWII, Beck served with the Australian Imperial Force (AIF). In 1943 he married Joan Isaacson and they had four children: Jonathan, Angela, Vanessa and Christopher who took the portrait of his father which survives in the Powerhouse Museum's Richard Beck design archive. After the war, Beck established Richard Beck Associates, design consultants for advertising and industry, producing packaging, corporate image design, exhibition and general advertising work - including freelance designs for several Melbourne advertising agencies including George Patterson, Patons Advertising, Castle Jackson Advertising, and Walker, Robertson, Maguire. Throughout his career, Richard Beck sustained a keen interest in raising standards in typography, design for industry and commerce, posters and photography in Australia. In the early 1950s he was one of a group of Melbourne designers and illustrators (including Lance Stirling, Owen Foulkes, Eric Macguire, Joe Greenberg, Ron Thompson and Arthur Leydin) who met informally to discuss design and the design profession in the United Kingdom, Europe, America and Australia. At the group's wine and food gatherings, Beck introduced many of these designers to the work of the Bauhaus and British poster artists like FHK Henrion, Abram Games and Hans Schleger (known as 'Zero'). His friends and colleagues included many leading Australian artists, architects, designers and photographers: Gordon Andrews, Douglas Annand, Arthur Baldwinson, Paul Beadle, Kevin Borland, Robin Boyd, Max Dupain, Max Forbes, Richard Haughton James, Elaine Haxton, Hal Missingham, Helmut Newton, Guelda Pyke, Wolfgang Sievers, Henry Talbot and Eric Thake. During the 1950s, Richard Beck won many awards and prizes, particularly in the Outdoor Advertising Association of Australia and the Australian Commercial and Industrial Artists Association's annual competitions and exhibitions. These competitions were designed to improve relations between artists, designers, commerce and industry. Among the many other awards won throughout his career are the National Packaging Association's gold medal for the best Australian export pack of 1960 (awarded to S Wynn and Co Pty Ltd for the Coonawarra Claret bottle designed by Beck) and prizes for his Neptune Service Station, Glazebrook Paints and Shell 24 sheet outdoor advertising posters. He received a runner-up award for his advertisement in the Architecture and Arts best full page magazine advertisement competition of 1954 and a bronze medal from the Italian Government at the International Stamp Congress in Milan for his Olympic Games stamp design of 1956. In 1961, Beck was awarded the Australian National Packaging Association certificate for his designs for the Bell Chemical Company's plastic packages and in 1963 he was awarded the gold medal at the Royal Adelaide Exhibition for his complete range of Bell Chemical Company's containers that were later exhibited at the International Design Exhibition in Paris during 1963. Richard Beck was also awarded a Certificate of Merit for outstanding excellence of work exhibited in the Australian Commercial and Industrial Artists Association's exhibitions. Beck's diverse range of design commissions included the design for Melbourne's first decorated tram during the Royal visit in 1954 and a number of stamps for Australia Post, including the centenary of the first Western Australian postage stamp in 1954, the Australian American Friendship stamp of 1955, Olympic Games publicity stamps between 1954 and 1956 and the 1971 Centenary of the Foundation of the Australian Native's Association stamp.As well as being selected to design the official poster for the Melbourne Olympic Games in 1956 and to work with a panel in designing the street decorations for the city, Beck also contributed work to the Graphic Arts exhibition of the Arts Festival of Olympic Games. In 1958 Richard Beck was elected an Associate of the Industrial Design Institute of Australia. Along with Douglas Annand, he received the prestigious award of Fellow of the Australian Commercial and Industrial Artists Association (ACIAA) for his outstanding excellence of work and notable contribution to the advancements of the interests of the profession. Beck was also an Honorary member of the Art Director's Club of Melbourne. In 1969, Richard Beck was appointed Head of Graphic Design at the Prahran Technical College. He remained there until1972. He was also a visiting lecturer at the Royal Melbourne Institute of Technology (RMIT). Richard Beck's work is represented in several local and international collections including the Victoria and Albert Museum in London, the London Transport Museum, the Art Gallery of Western Australia, the Art Gallery of Victoria, the Australian National Gallery, the National Library of Australia, RMIT Design Archives and the Powerhouse Museum (Museum of Applied Arts and Sciences) in Sydney. In 1992 Richard Beck was posthumously awarded the inaugural Hall of Fame Pinnacle Award by the Australian Graphic Design Association. Official poster, Olympic Games, Melbourne Australia 1956. The design was submitted to a design competition organized by the Melbourne Olympic Committee in 1954. Selected as the winning entrant, the design was first released as a postage stamp in 1954 and then as a poster in 1956. Part of the designer's personal archive acquired by the Powerhouse Museum in 1991.